The ideas and culture of ancient Rome influence the art, architecture, science, technology, literature, language, and laws of today. Ancient Rome had a large influence on the modern world. Though it has been thousands of years since the Roman Empire flourished, we can still see evidence of it in our art, architecture, technology, literature, language, and law. From bridges and stadiums to books and the words we hear every day, the ancient Romans have left their mark on our world. Ancient Romans have had a tremendous impact on art and architecture. We can find traces of Roman influence in forms and structures throughout the development of Western culture. Although the Romans were heavily influenced by ancient Greece, they were able to make improvements to certain borrowed Greek designs and inventions. For example, they continued the use of columns, but the form became more decorative and less structural in Roman buildings. Ancient Romans created curved roofs and large-scale arches, which were able to support more weight than the post-and-beam construction the Greeks used. 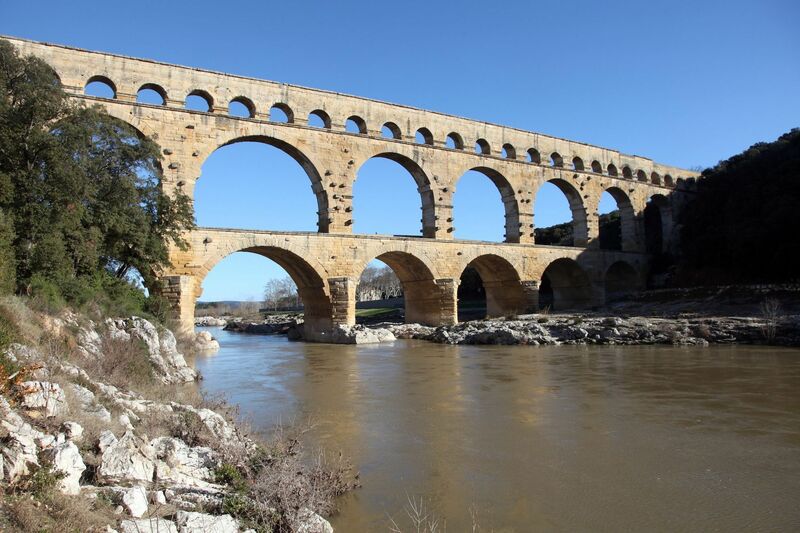 These arches served as the foundation for the massive bridges and aqueducts the Romans created. The game-loving ancients also built large amphitheaters, including the Colosseum. The sports stadiums we see today, with their oval shapes and tiered seating, derive from the basic idea the Romans developed. The arches of the Colosseum are made out of cement, a remarkably strong building material made of volcanic ash and rock. Modern scientists believe that the use of this ash is the reason that structures like the Colosseum still stand today. Roman underwater structures proved to be even sturdier. Seawater reacting with the volcanic ash created crystals that filled in the cracks in the concrete. To make a concrete this durable, modern builders must reinforce it with steel. So today, scientists study Roman concrete, hoping to match the success of the ancient master builders. Sculptural art of the period has proven to be fairly durable, too. Romans made their statues out of marble, fashioning monuments to great human achievements and achievers rather than to gods and goddesses, the focus of many Greek sculptures. You can still see thousands of Roman artifacts today in museums all over the world. Ancient Romans pioneered advances in many areas of science and technology, establishing tools and methods that have ultimately shaped the way the world does certain things. Along with large-scale engineering projects, the Romans also developed tools and methods for use in agriculture, such as wheeled plows and oxen-drawn harvesting machines. The Romans became successful farmers due to their knowledge of climate, soil, and other planting-related subjects. They developed ways to effectively plant crops and to irrigate and drain fields. Their techniques are still used by modern farmers, such as crop rotation, pruning, grafting, seed selection, and manuring. The Romans also used mills to process their grains from farming, which improved their efficiency and employed many people. Much of the literature of the world has been greatly influenced by the literature of the ancient Romans. During what is considered the “Golden Age of Roman Poetry,” poets like Virgil, Horace, and Ovid produced works that would have an everlasting impact. Ovid’s Metamorphoses, for example, inspired authors such as Chaucer, Milton, Dante, and Shakespeare. Shakespeare, in particular, was fascinated by the ancient Romans, who served as the inspiration for some of his plays including Julius Caesar and Antony and Cleopatra. While Roman literature had a deep impact on the rest of the world, it is important to note the impact that the Roman language has had on the Western world. Ancient Romans spoke Latin, which spread throughout the world with the increase of Roman political power. Latin became the basis for a group of languages referred to as the “Romance languages.” These include French, Spanish, Italian, Portuguese, Romanian, and Catalan. Many Latin root words are also the foundation for many English words. The English alphabet is based on the Latin alphabet. Along with that, a lot of Latin is still used in the present-day justice system. The use of Latin words is not the only way the ancient Romans have influenced the Western justice system. Although the Roman justice system was extremely harsh in its punishments, it did serve as a rough outline of how court proceedings happen today. For example, there was a preliminary hearing, much like there is today, where the magistrate decided whether or not there was actually a case. If there were grounds for a case, a prominent Roman citizen would try the case, and witnesses and evidence would be presented. Roman laws and their court system have served as the foundation for many countries’ justice systems, such as the United States and much of Europe. The ancient Romans helped lay the groundwork for many aspects of the modern world. It is no surprise that a once-booming empire was able to impact the world in so many ways and leave a lasting legacy behind. shape that looks like an upside-down "U." style and design of buildings or open spaces. to cause a plant to reproduce asexually by inserting one part of a plant into another plant. new idea, machine, product, device, or process. material, ideas, or history passed down or communicated by a person or community from the past. to lead the way or be among the first to do something. beginning or leading up to. to cut or trim branches from a tree, bush, or shrub. three-dimensional artwork that is carved, molded, or modeled to create its shape. to see and be aware of by personal, first-hand knowledge.